Stimulating economic growth in South Africa has been a major challenge for both Government and the private sector over the past decade. The fresh produce export industry has shown how innovation-based research is a critical part of the solution to enhancing competiveness, market access and growth. Consider, for example, the case of the locally developed avocado cultivar, called ‘Maluma’. Thanks to research that showed how fruit damage could be limited through rapid cooling after harvesting, this avocado cultivar is now being exported in much higher volumes than before. 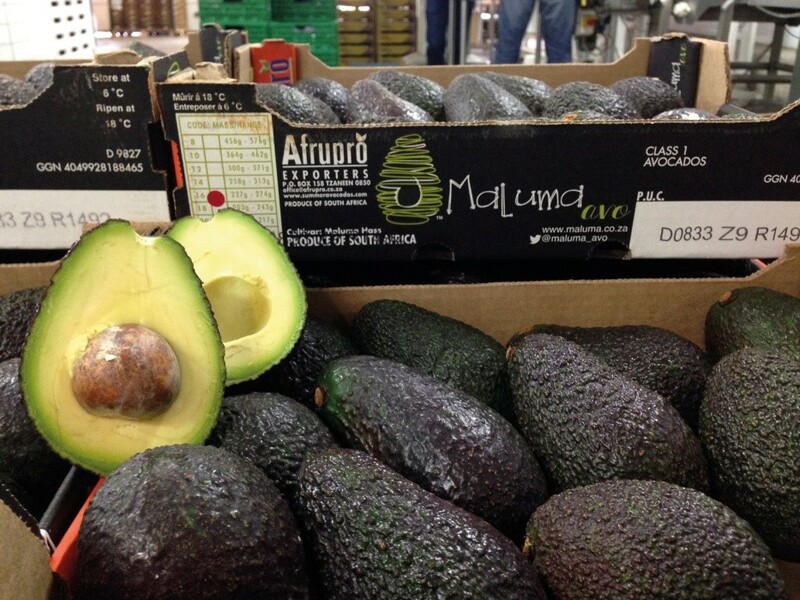 With only 10% less fruit damage, the avocado industry saves more than R3.3 million a year. Improved production and harvesting practices have furthermore led to higher prices for the commodity. Export customers now pay R50 per carton more for better quality fruit, yielding an additional R15 million on 300 000 cartons exported per year. All this for a research investment that cost less than R480 000. The programme under which this study – and many other such projects – are carried out, is the Post-Harvest Innovation (PHI) Programme. The PHI Programme is an initiative of the Fresh Produce Exporters’ Forum (FPEF), and one of seven Sector Innovation Fund (SIF) programmes partially funded by the National Department of Science and Technology. It is widely regarded as the most successful of these public-private partnership RDI programmes. 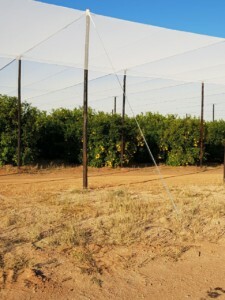 Research carried out under the PHI Programme focuses on the development and improvement of post-harvest technologies, through a series of collaborative projects between universities, research organisations and industry associations, the latter including the Subtropical Growers’ Association, HORTGRO Science, the Pomegranate Producers’ Association of South Africa, South African Table Grape Industry, Citrus Research International, Cape Flora SA, Tomato Growers’ Organisation and the Onions Producers’ Association. The Programme has been successful in rolling out 35 new projects during its third phase of operation between 2013 – 2017, ensuring a growing level of innovation in the industry. 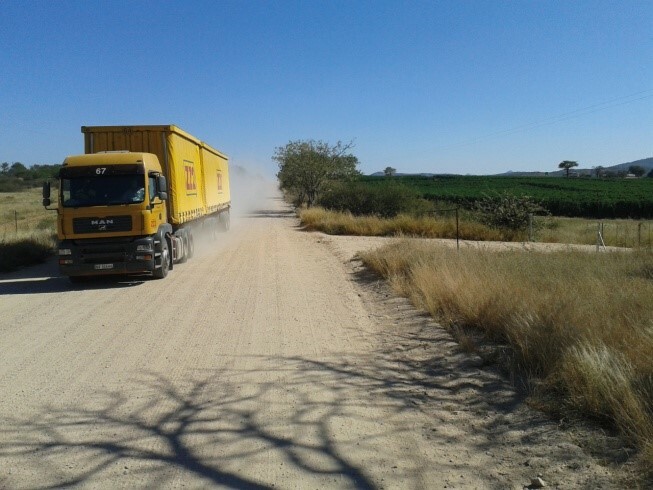 Export statistics show that fresh fruit exports have consistently grown since 2015 to 2017 from R30.2 billion to R40.5billion, which amounts to a 34% growth over the two year period. Linked to these projects, the PHI Programme also increased high level human capacity to support future industry growth, having supported the training of 40 post graduate students and 6 postdoctoral students related to these projects. A project that certainly supports Kruger’s assertion is the study into ways to decrease the damage suffered by ‘Star Ruby’ grapefruit while in cold storage en route from South Africa to export destinations in the USA and the East. Just over R617 000 was spent on the study. Today, five years later and with the study’s recommendations implemented, South Africa’s exports to the USA, China and South Korea have jumped from 88 704 cartons per year to 1.866 million – a 21-fold increase. Over the same period, the national income from ‘Star Ruby’ grapefruit exports have increased from R68 million to R323 million per year. Another powerful example of the bottom line impact research can have can be found in the pome fruit sector. Superficial scald is a post-harvest physiological disorder that seriously limits the storage life of a number of apple and pear cultivars. It appears in the form of brown or black patches on the skin of the fruit, and although it does not affect taste, it certainly decreases the fruit’s value. The chemical that has been used in South Africa since the 1960s to control superficial scald is now so tightly regulated in the EU that the local industry had to find an alternative solution. A study was designed to test international storage protocols on locally produced cultivars that had to complete long journeys to their export destinations. Approximately R2 million was invested, resulting in the development of storage protocols that effectively prevent superficial scald on susceptible apple and pear cultivars. As a result, exports of ‘Granny Smith’ apples and ‘Packham’s Triumph’ pears to the EU could continue, and increased by 25%, between 2014 and 2017. The value of this continued trade was R3,44 billion. If the new technologies were not available, only 7% ‘Packham’s Triumph’ pears could be exported to the EU, and only about 35% of the current apple exports would have been possible. Research has proven to be invaluable in the development of new export markets, of which pomegranates are a prime case in point. In the past decade, pomegranates have become one of the few new additions to the South African fruit basket. 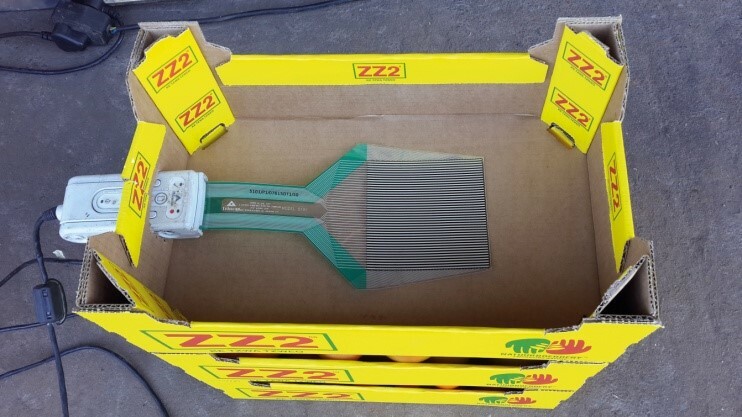 The industry has seen significant growth since the first commercial plant propagating material was brought in from India, Israel and the USA in the early 2000s. Touted as a superfood, the market for pomegranates is booming. South Africa competes with countries such as Chile, Australia, Peru and Argentina to supply the off-season demands for pomegranates of consumers in the Northern Hemisphere from March until May. However, exporting these fruits can be a risky business. Fungal diseases, such as black heart disease, can cause post-harvest losses of up to 30% and more, and because external symptoms are seldom visible at harvest, it is virtually impossible to take preventative action. In the interest of establishing and maintaining a competitive edge in the global market, two PHI Programme-supported studies were done to create a harvest maturity index, an index of post-harvest fungal diseases that compromise export quality and jeopardise market access, and standards for handling, packaging, storage, transport and marketing. 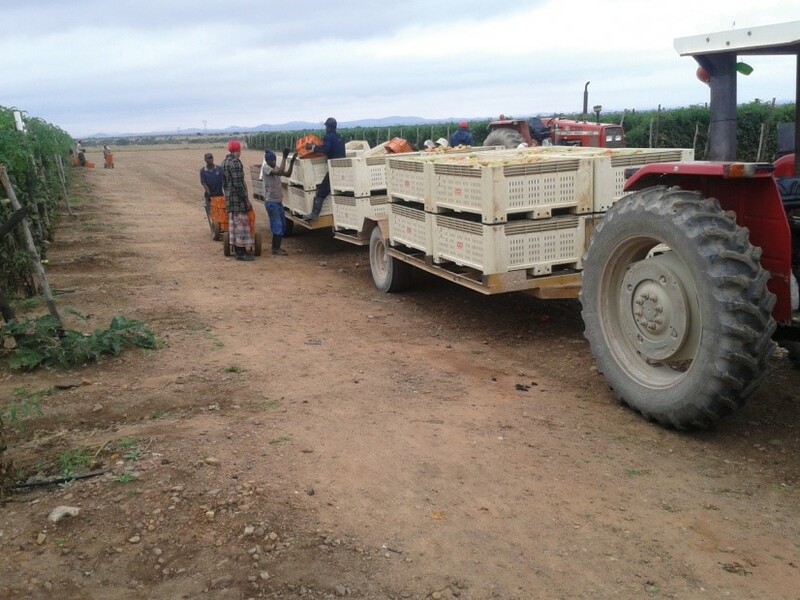 An investment of R823 000 has armed this fledgling industry with substantial new knowledge on production and handling protocols that will enable producers to increase the volume of sellable fruit and its competitiveness among Southern Hemisphere exporting countries. The industry body, POMASA, estimates a benefit of between R20 million and R45 million in the coming season through improved quality and reduced decay incidence. Not only exporters benefit from the PHI Programme. 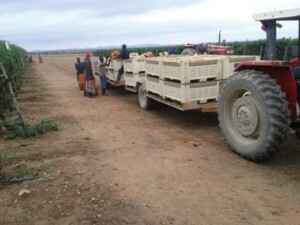 South African tomatoes are produced mainly for domestic consumption, and although local production practices are among the best in the world, large-scale producers can suffer losses of up to R30 million per year due to handling and logistics inefficiencies, including road transportation. The PHI Programme and the Tomato Producers’ Organisation jointly invested R665 000 in a research study to measure and quantify the strains tomatoes suffer depending on packaging type, vehicle type and travel speeds, and then to relate these variables to the quality and shelf life of the tomatoes. 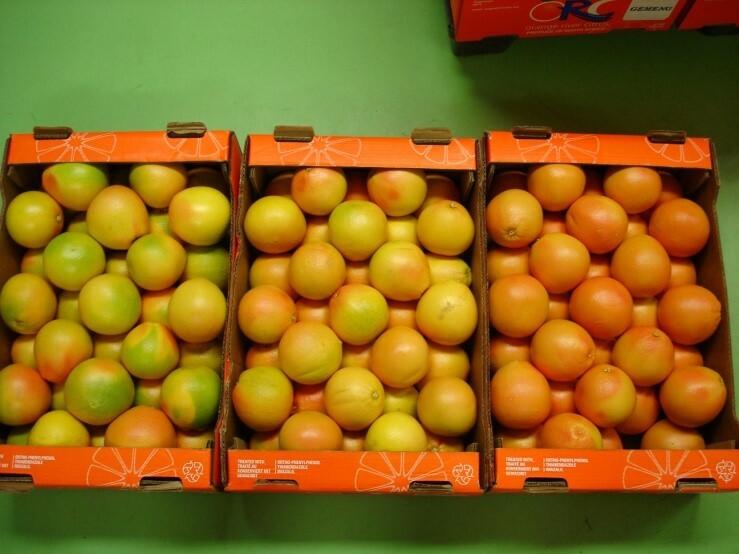 The study resulted in deterioration models that can be used to predict quality losses under different supply chain conditions, as well as integrated post-harvest treatments and handling methods to extend the shelf life of tomatoes. The work also has application on infrastructure planning and development, as it provides government agencies with models to plan rural road maintenance. The impact of this study is significant. 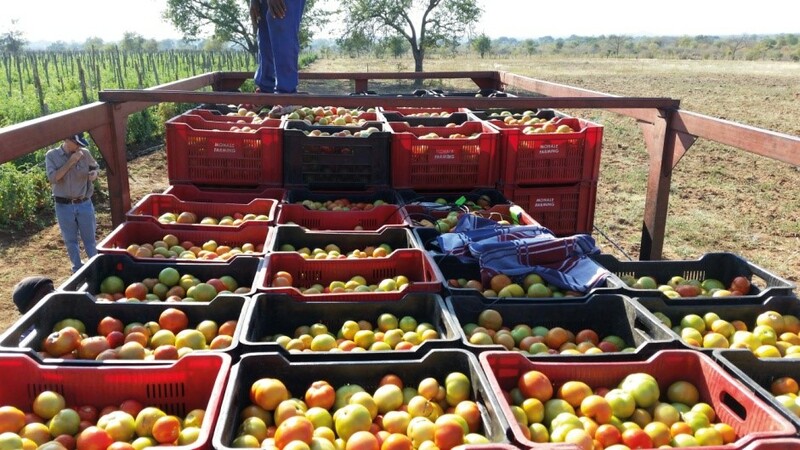 For example, simply extending the shelf life of tomatoes by one to three days due to better road maintenance, increases industry revenue by R20 million per season. 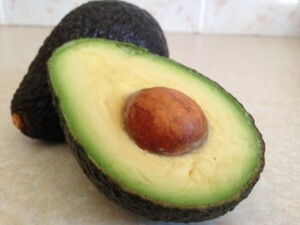 [Caption:] ‘Maluma’ avocados have a favourable seed-to-flesh ratio. 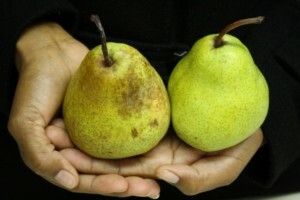 [Caption:] ‘Maluma’ is characterised by a rough skin that is less easily damaged during harvest, export and ripening. [Caption:] ‘Star Ruby’ grapefruit, depleted of lycopene, scars easily when chilled. Chilling injury does not damage the fruit itself. However, the marks that are left on the rind of the grapefruit are unattractive, which lowers the price consumers are willing to pay. [Caption:] ‘Star Ruby’ grapefruit: three shades of lycopene. 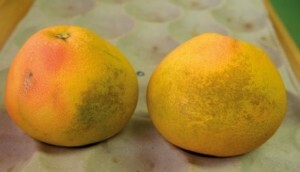 [Caption:] ‘Star Ruby’ grapefruit that grows in full shade develops high levels of lycopene. 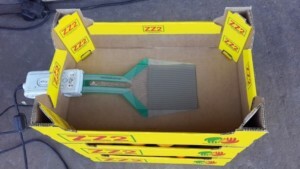 [Caption:] Colour charts like these are now being used in pack houses to help make export decisions. Fruit that is completely pink (number 1 on the chart) or more than 80% pink (number 2) can be exported to the USA. 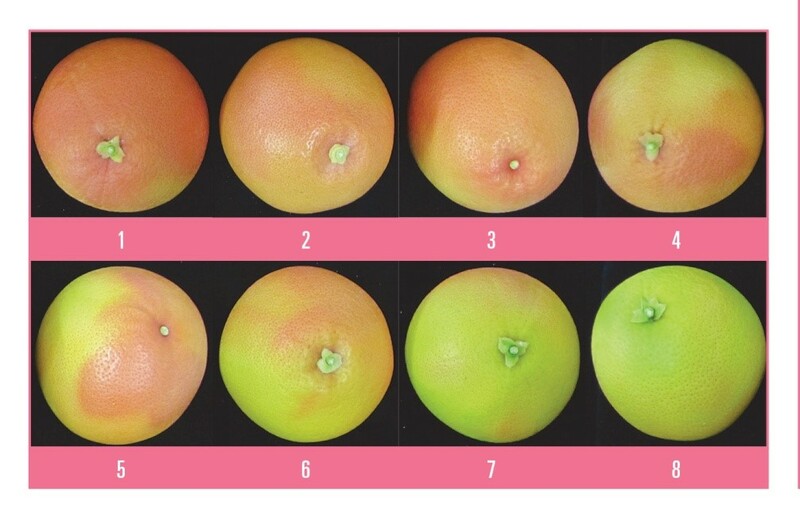 Fruit with a 60% to 80% pink cover (numbers 3 and 4 on the chart) can be exported to Japan given that country’s shorter cold sterilisation requirement. Fruit that falls in numbers 5 to 8 on the chart, can only be exported to markets that have no cold sterilisation requirements. [Caption:] Pears with scald and without scald. 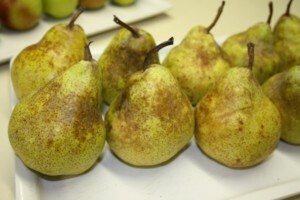 Pears stored in dynamic controlled atmosphere remain firm and are deliciously tasty and fragrant once ripe. 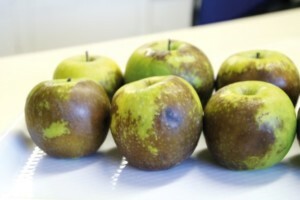 [Caption: (1 & 2)] ‘Packham’s Triumph’ pears (1) and ‘Granny Smith’ apples (2) show severe superficial scald symptoms after seven months storage in regular atmosphere at -0,5°C and 0°C, respectively. The brown and black patches only appear once the fruit is taken out of cold storage and placed on display. 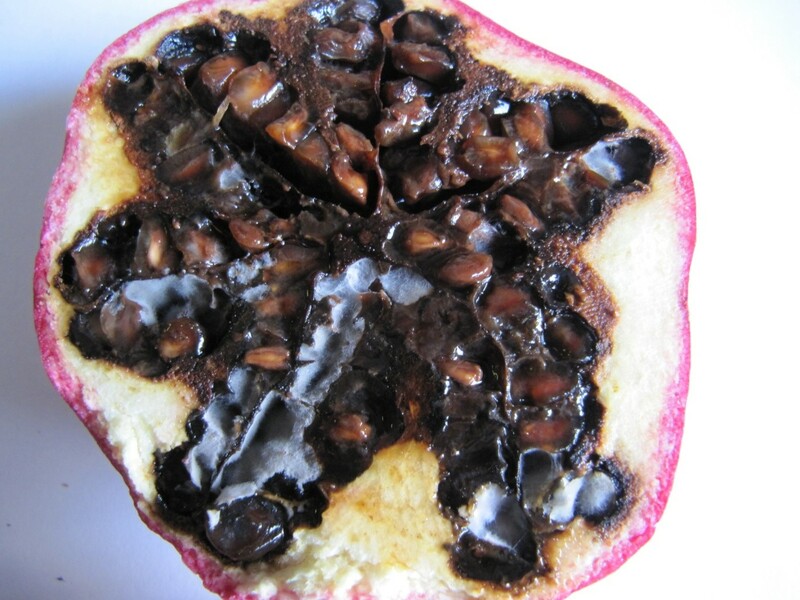 [Caption:] Black heart disease caused by Alternaria. 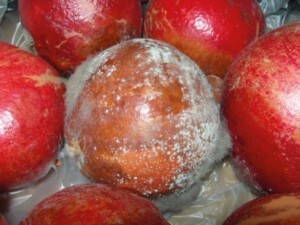 [Caption:] Stored pomegranate fruit covered with fungal growth. [Caption (1 & 2):] Lugs and bins filled with tomatoes are stacked on a trailer on their way to the packhouse. [Caption:] Lugs and bins filled with tomatoes are stacked on a trailer on their way to the packhouse. The rural road network – on which most farmers depend – is in a poor state of repair, and tomatoes are reaching the market the worse for it. [Caption:] Accelerometers and pressure mats were used to measure the frequencies that tomatoes were exposed to while in transit.